I love shopping. Window or otherwise. It doesn't matter whether I buy anything because I get to see some really funky things. And that always brings a smile to my face. Not as wide as this mannequin's but still, enough to keep me browsing. And I have a dinner I have to go to tonight. The smile will have to be wide, very wide. Which reminds me, I need to get my teeth whitened. What a way to start the week! 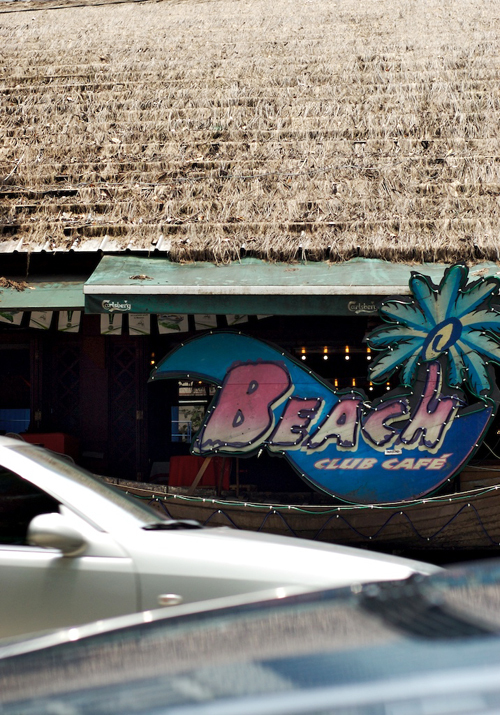 This is the front of one of KL's many drinking holes, The Beach Club. Looks really rough in the daytime but turns into a banging pub at night. Known for it's white men and local women patronage Know what I mean? We went there for a hen's night for a laugh years ago. Suffice to say we didn't stay very long. Anyway, I composed this shot with the cars driving past to make it look like waves vere crashing. I was missing the beach. It's Sunday, usually a good day to laze on the beach. However, I'll be home editing photos from a shoot I did a couple of days ago. Maybe I'll put a small paper umbrella in my coffee. The weekend comes again and what better way than to start it with a fresh picture of nature. With so many shots of stuff, I completely neglected the simple things. 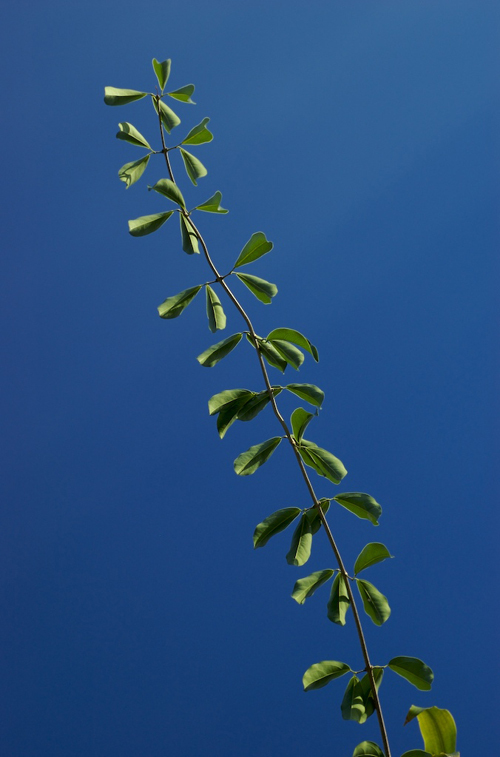 Take this branch of leaves shooting up towards the clean blue sky, for instance. Nice, innit? 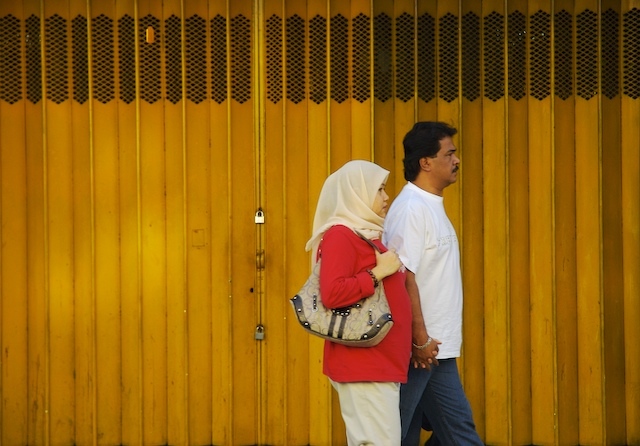 May I present the newly crowned King and Queen of Malaysia. Tuanku Mizan Zainal Abidin, the Sultan of Terengganu, officially accended the throne as the 13th Yang di-Pertuan Agong (King) on April 26th, 2007. There are 9 Sultans in Malaysia and through a rotation system, each becomes King for a span of 5 years. 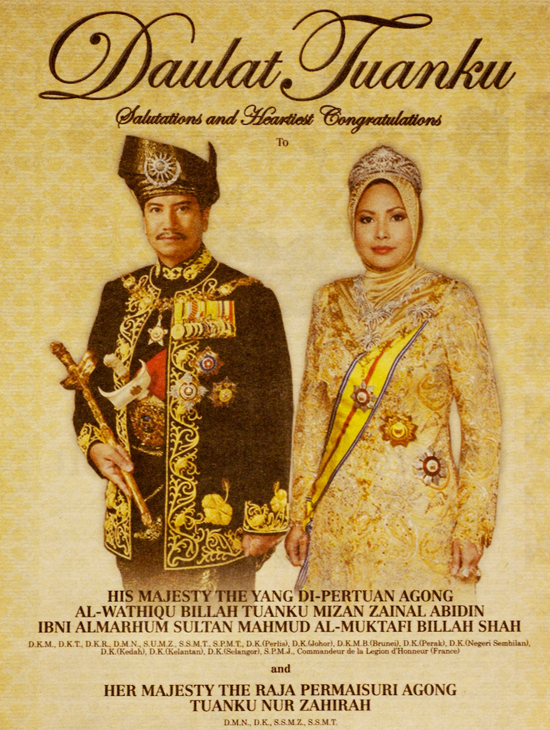 For the next 5 years, Tuanku Mizan (an ardent equestrian) with his consort, Tuanku Nur Zahirah, will represent our country in all matters of tradition. Long live the King! I'm not sure if this is a sign or graffiti but it definately caught my eye. 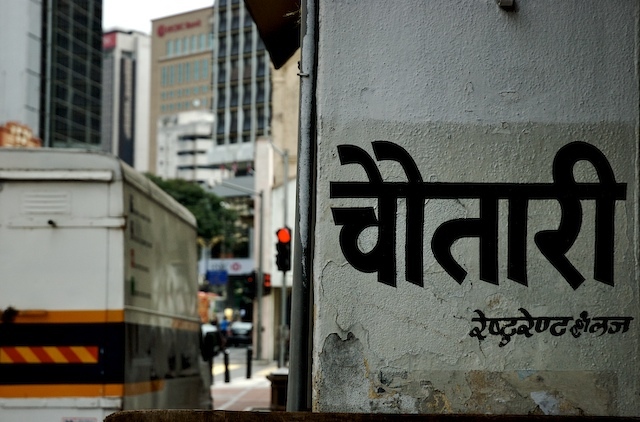 It looks like Hindi. Also looks like the word, Art. And you well know any kind of art attracts my attention. Would anyone like to translate it for me? Don't argue with me. I know I'm right! That's how I see it. How often have you caught yourself saying those exact words? Yes? No? Maybe. This limited view didn't stop me from snapping a shot. 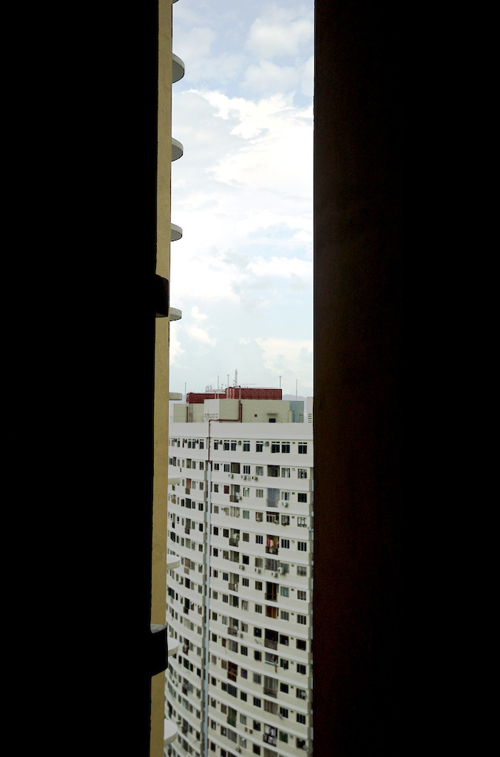 The sky and block of apartments are sandwiched between 2 taller blocks of apartments. The view was good and I knew I was right to snap one. Don't argue with me. Some of you may be wondering what the title has to do with today's picture. Ok, allow me to explain. This was not taken by me. I was out for dinner with a couple of friends and one of them, Candice, brought her adorable and excitable son Zhiwei along. He was once a child you wanted to slap but in the past year has learnt to control his temper. I have since treated him like a son I'll never have and talked him through many things. Despite Candice's concerns, I let him fiddle about with my camera while we waited for dinner to arrive. Seeing my chunky DSLR in his small hands was a joy. He took close to 100 shots. Some of them are really good. Take this shot for example. His composition skills obviously rival mine. Did I forget to mention he's only 5 years-old? This is Paul. 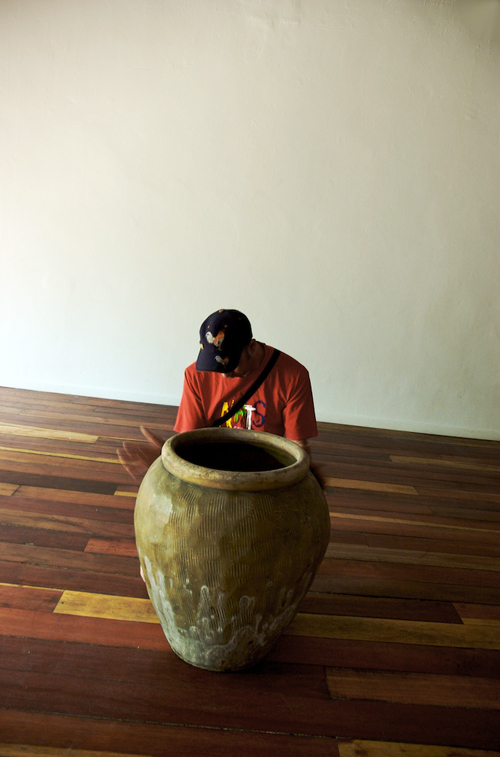 He's a member of the Tugu Drum Circle. The both of us are part of a theatre project which involves disabled teenagers, both mental and physical. We meet for 6 hours every Tuesday. This month, they're learning Capoeira, Costumes and Drumming. The project will run until March 2008 where they put on their own show. We are hoping to take them through everything that goes into a performance: dance, music, acting, writing, videography, photography and design (costumes and graphic). I'm taking them for acting and photography. In this shot, Paul is drumming the urn to listen to it's sound vibration. He added it to the drums he brought along. The kids really love his drumming sessions. If you'd like to meet these talented individuals, please go over to my Flickr page. I've so far uploaded portrait shots taken while they were making their own head-dresses. 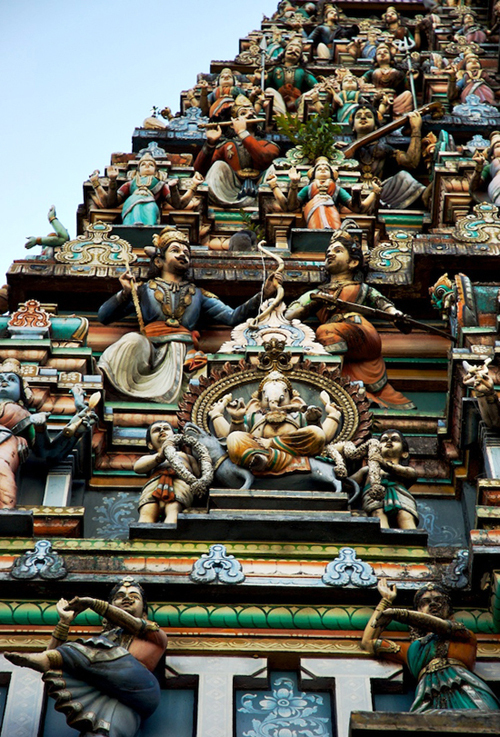 I posted a shot of this Hindu temple last year. A couple of days ago, I had the opportunity of taking another shot while stuck in traffic. It was my luck my car stopped right in front of it. I was feeling quite agitated that day. Traffic on every road I took and I was late for a meeting. All that evaporated the moment I saw Ganesha and the deities smile down on me. Feeling somewhat lighter, I made it to the meeting without any angst. Phew! It's Sunday. A day to rest, read a good book, give the dogs a bath, have some friends over, whatever you wish really. Enjoy the day. 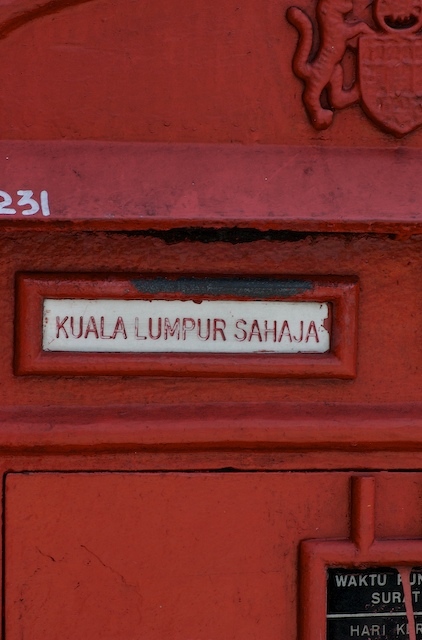 What happens when a Polish mailbox is discovered inside a Malaysian mailbox? You get a mailed! This community of ours is fantastic, isn't it? Thanks Glenn. I'm definately having a great start to a great weekend. Hope you are too. This window display caught my eye because, to me, it looked like the torso was decapitated from the legs and the insides were spilling out. I must commend the display artist for this clever idea. 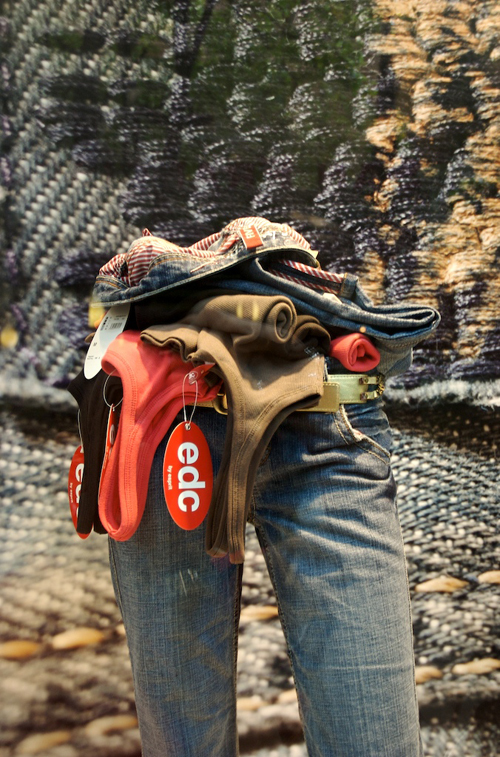 Fashion is not what you wear but what you have inside. In this case it's rolled up shirts, blouses and an extra pair of jeans. Like I always say, let it all hang out! 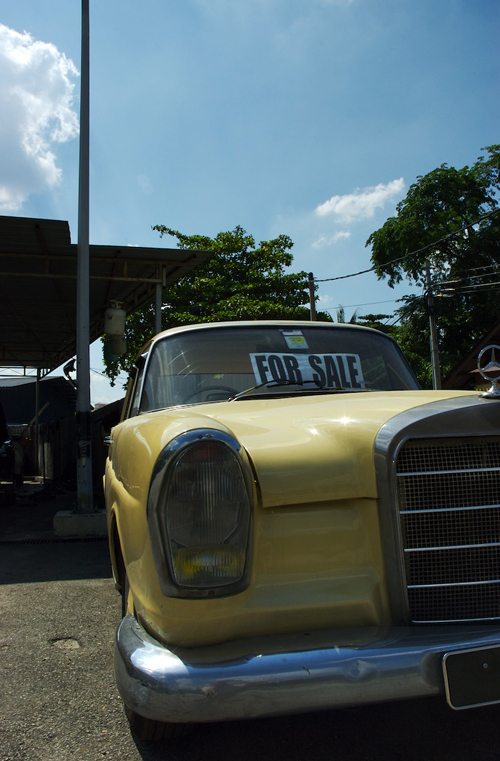 Anybody looking for a set of wheels, preferably a set attached to an old Mercedes? Came across this beauty of a car when I drove into a petrol station to fill up the tank of my own car. Just look at it. Still a great looking car. Then I started thinking about the sturdiness of cars. BMWs and Mercs, even after many years, still look well-built and solid. Other cars, as great as they looked when first released, don't seem to hold up. Not very solid, infact looking rather thin after a couple of years. Like the car I have. It has the reputation of being constructed with Milo tins. What do you think of my observations? 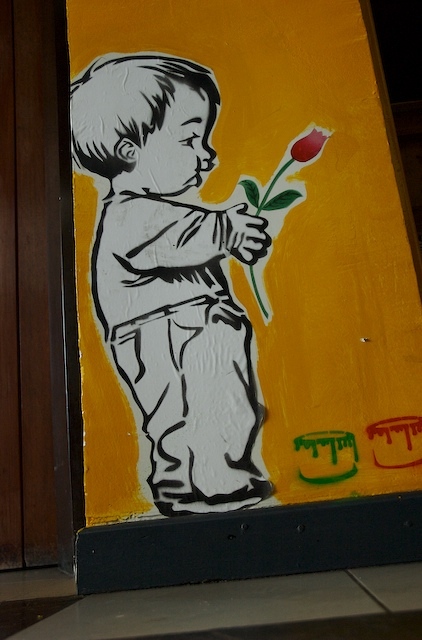 Stencil street art. 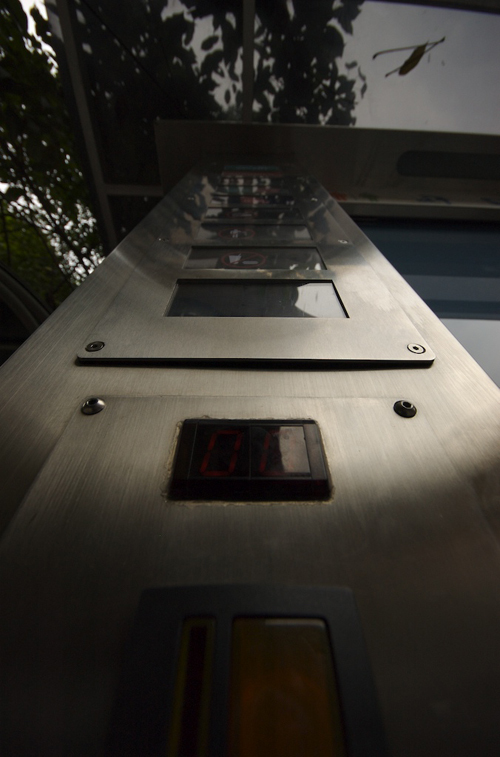 Is it the easier solution to time constraints and over-zealous authorities? Whatever it is, I thank the artist of this one who made me stop and smile for a moment. Hope you find it as amusing as I do. Is it a rose or a tulip? And what about the green and red pots of paint? It's Monday! Another fabulous week begins. I didn't get a chance to take any pictures this past weekend. I searched through my vaults and found this one which I didn't even realise I snapped. It's me! Well, my shadow that is. 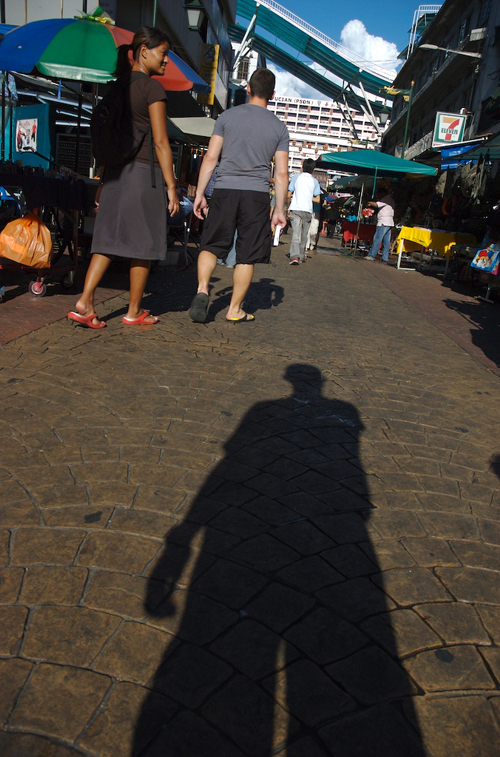 Taken in Petaling Street with the sun beating on my back. A fun shot, wouldn't you agree? 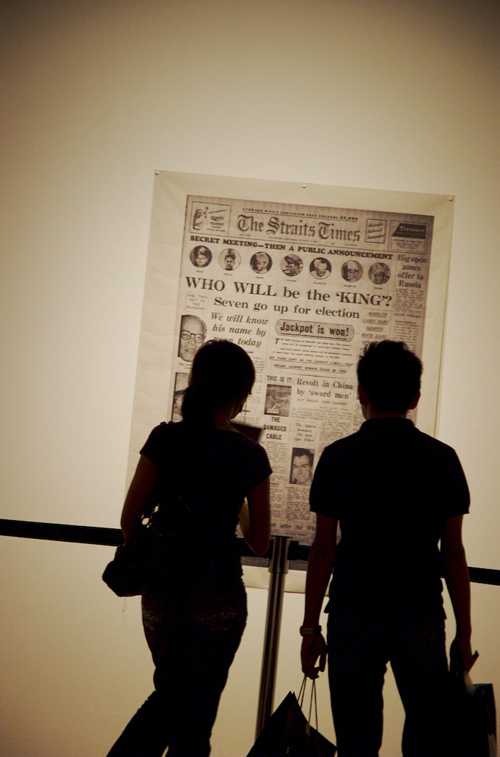 Galeri Petronas is currently running a photography exhibition, Photojournalism and the Imaging of Modern Malaysia 1957-2007, to commemorate the 50th anniversary of Malaysia's independence. My friends (whose silhouette you see here) and me went to have a look-see. Iconic pictures we've seen throughout our lives as well as the more obscure ones. We walked into this small room to read this blown up newspaper. The headline questions the crowning of the first King. Which one of our Sultans will have that honour? Unlike the monarchy in the rest of the world, our King rotates between the Sultans every 5 years. Photography in the exhibition is not allowed, so I snuck out this shot. Then I noticed 2 other people taking pictures. I asked the person at the reception desk. Flash not allowed. And I went along my merry way, enjoying the years as they passed by. the young and the restless.com. 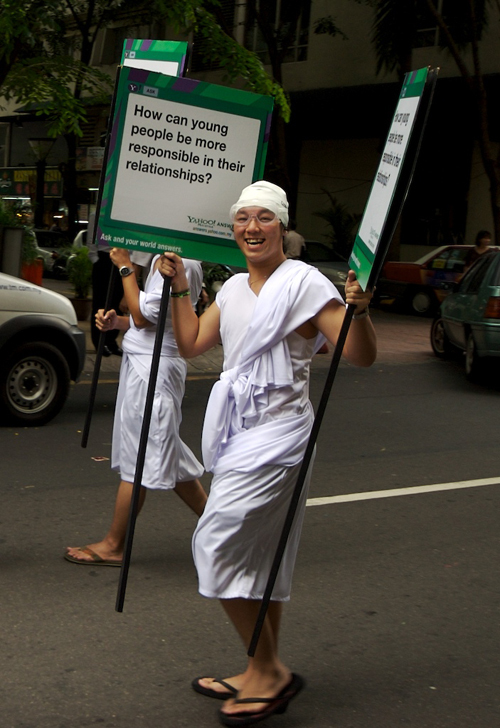 I'm strolling the streets looking for the next KLDP picture, as I usually do, when I came across a group of teenagers wrapped in white. This fellow turned to smile for me. Have a look at the sign he's carrying. It seems we can now find the answers to every parent's concerns for their kids. Can you hear the roar of hundreds of thousands of parents shouting Yahoo!? Which online search engine do you use for your life's questions? I'm a Googlerista. Let the weekend begin. Press Enter. 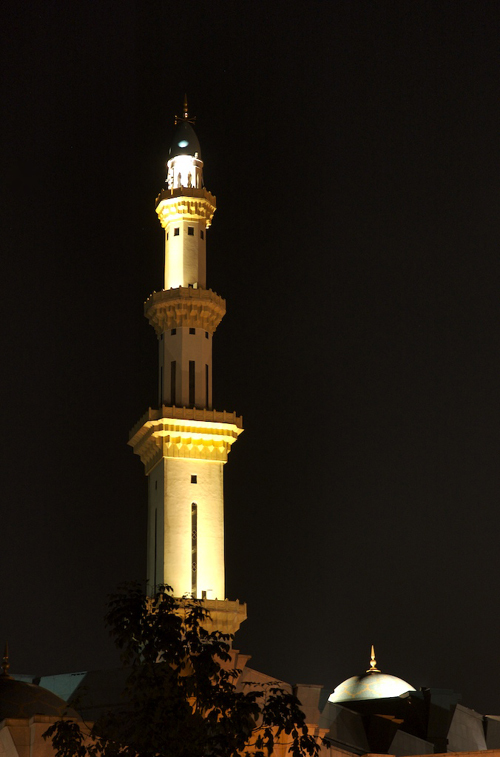 It's pure coincidence that a mosque's minaret follows yesterday's chinese temple. Not that I'm feeling overtly religious. Friday is the day Muslims congregate for afternoon prayers. No, I'm not one of them. I'm a pseudo spiritualist. I believe in a universal force. It doesn't matter where I pray. All that matters is where my heart is and if my prayers are heard. Does it make a huge difference if I was physically in a mosque? On a Friday? I'd be in deep poo-poo if the religious authorities read this. Pod has oral surgery today. May the Force be with You. 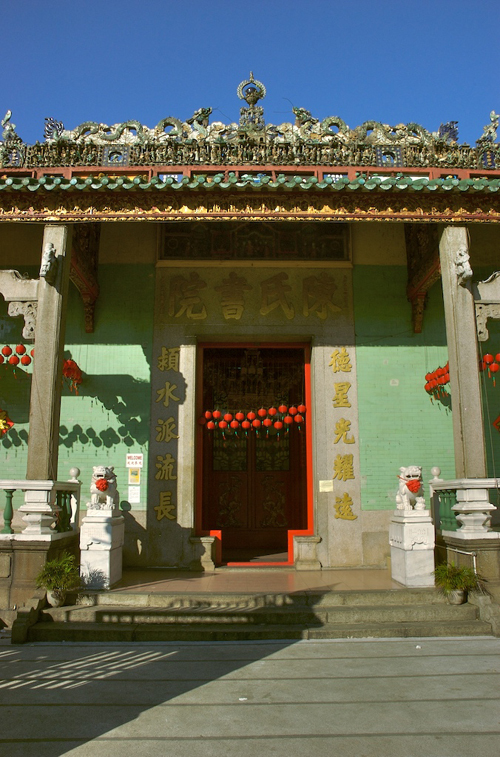 The entrance of the temple. Enter at your own peril. That's how I felt when I was a child. As well-behaved as I was then, I still thought the figurines would jump off their mount and bite me for the sweet I nicked from my cousin's bag. I've always been fascinated with places of worship. Churches, temples, mosques, synagogues. There's something in the air that makes it calm and when you enter, the world outside disappears. Very different from the quiet of museums. Museums tend to remind me of what has happened out there. Do you share the same thoughts? 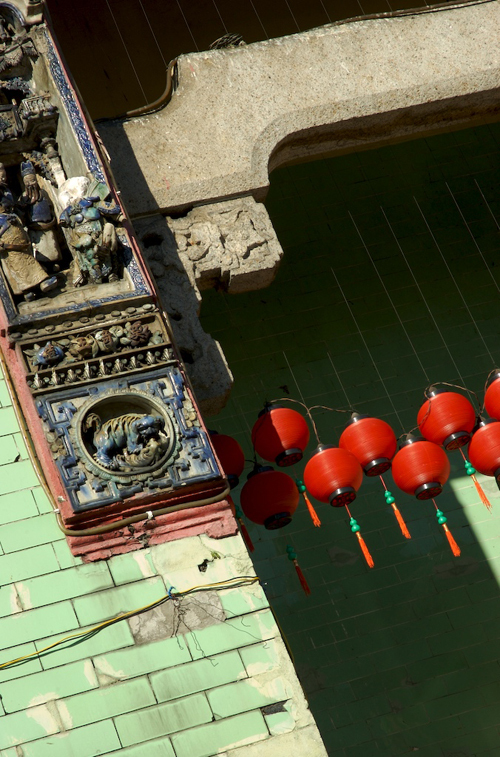 From a Chinese medicine shop to a Chinese temple. It was a lovely sunny day. 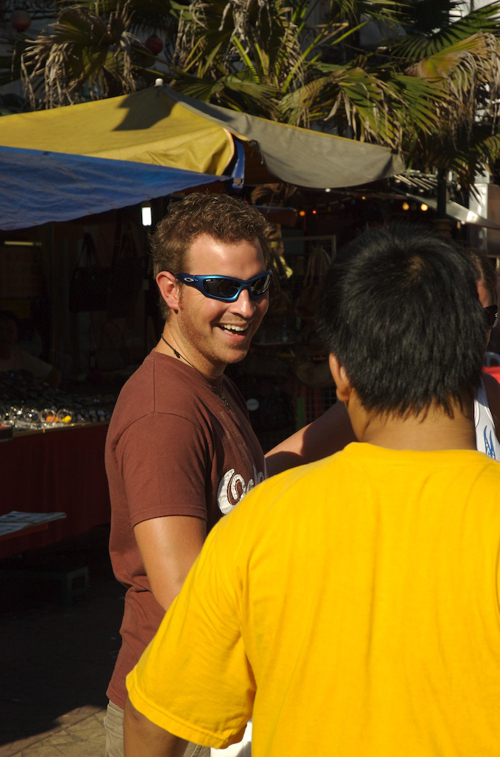 My friends had some visitors from the UK and we brought them to Petaling Street. I left them to browse the cheap and fake designer bags and watches. I headed towards the temple which I hadn't been to since my grandmother was alive. She was somehow related to the keeper. Can you see the clay figurines at the top left corner? She used to tell me that if I was naughty, they would come alive and bite me at night. Of course I believed her. I also noticed the plastic lanterns. Lasts longer than paper I guess. I'll post another shot of the temple tomorrow. Bird's Nest, Ginseng, Golden Mushrooms, Red Dates, Sea Cucumber. 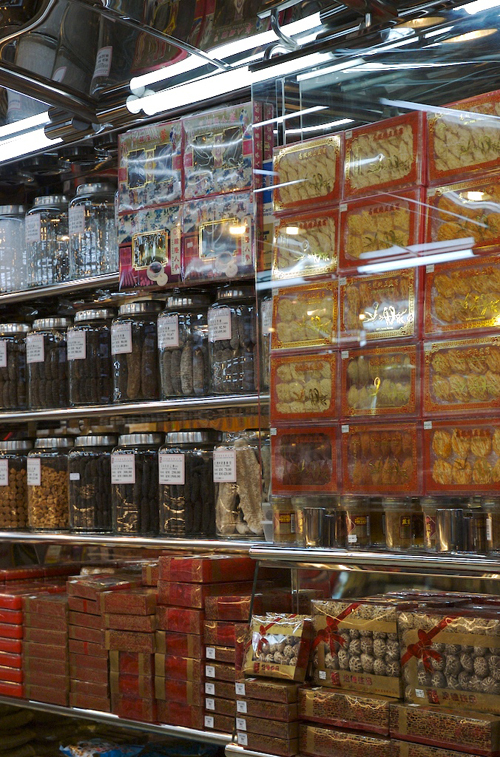 Everything herbal and natural is what you'll find in a chinese medicinal shop. In the old days, these shops were in the older parts of the city. All the drawers and shelves were made of wood. This, coupled with the various roots and herbs gave off a musky yet comforting scent. Whatever you bought was wrapped in waxed brown paper. You'd be hard pressed to find such shops these days. As you can see here, glass, plastic and steel have replaced wood. Yes yes, save the trees and all that but the bloody fluorescent lights! 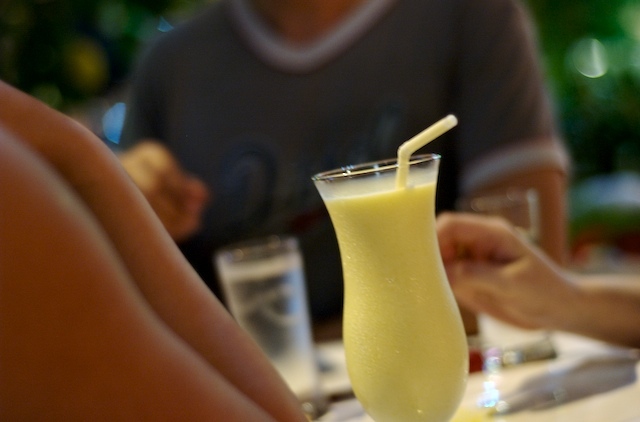 Went out for dinner with a couple of friends to a place called Mythai. Not too bad. The portions are a bit small which is my only complaint. It was good seeing this one friend of mine, Stephanie. She's also my publicist and we haven't caught up for nearly a year. Anyway, I was a bad boy. 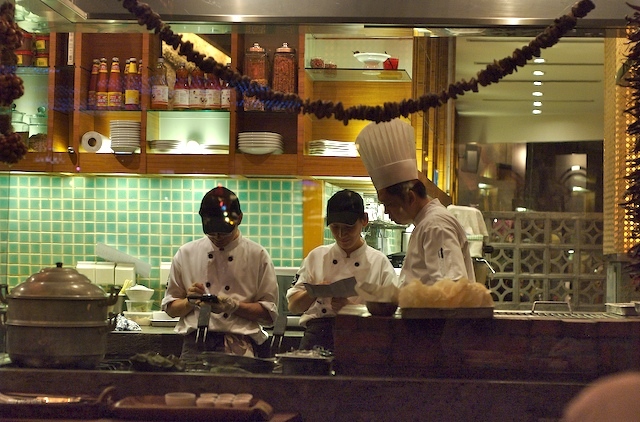 I was in mid-conversation when I noticed the lights bouncing off the head of one of the chefs behind the glass panel. I immediately reached for my camera. Once done, I resumed talking. Steph just smiled. She knows I'm easily distracted. 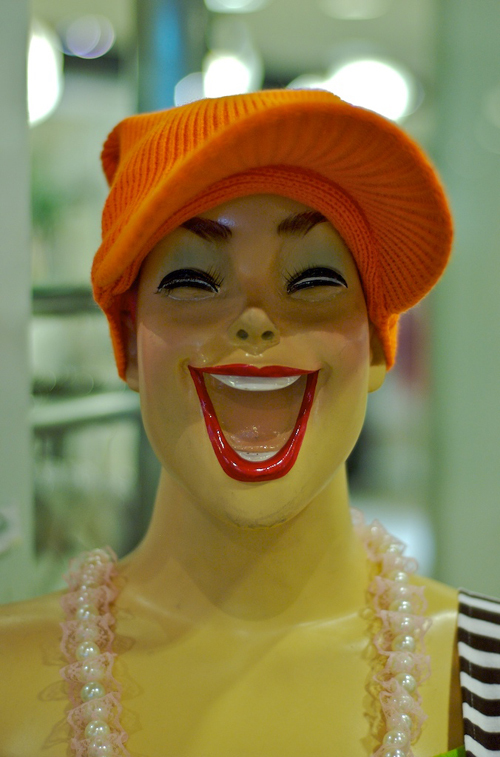 What do you think this tourist is smiling about? Well, the guy in the yellow shirt is trying to sell him something. Mr.Smiley is resisting and trying not to offend him. It's a lovely Sunday. Hope you have a good day. A couple holding hands. Sweet isn't it? Reinforces my faith in the power of love of the relationship kind (and not the Jennifer Rush/Celine Dion song kind). For those of you old enough to hide multi-coloured eggs and stroke fluffy bunnies, have a great Easter weekend. For those of you afraid of giant pink fluffy bunnies jumping out of bushes, tough! It's the weekend of the Malaysian Grand Prix. 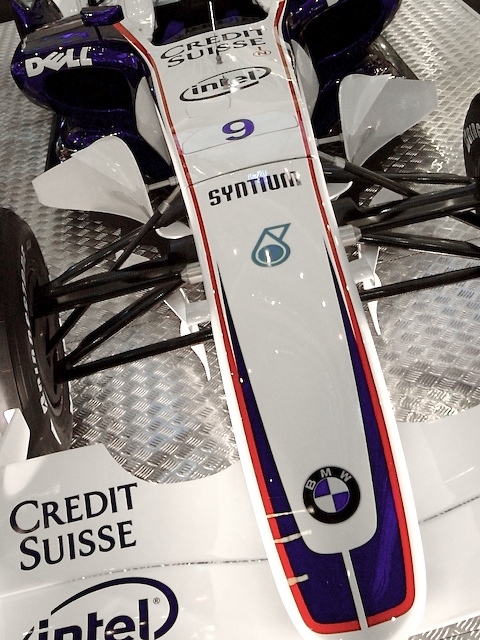 And Team Petronas BMW Sauber are looking to give Ferrari a run for their money. The sports section are hailing Kimi Raikkonen as the driver to beat. Who knows? Anyone a GP fan? Who have you placed your bets on to take the chequered flag? You can check it the Malaysian circuit here. 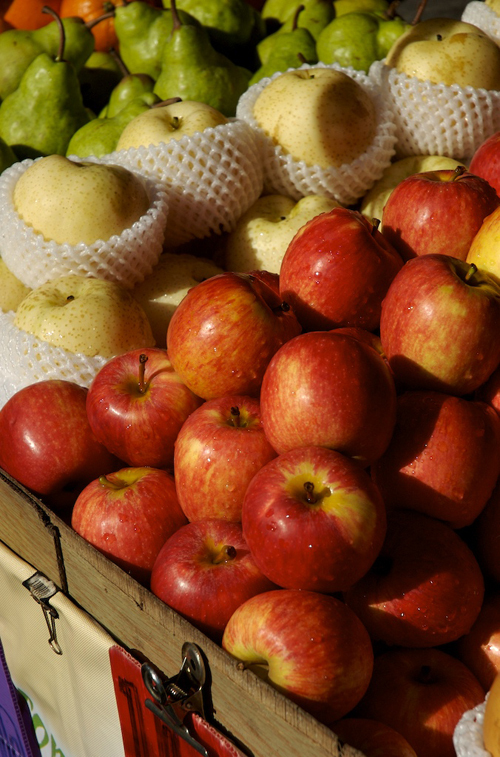 Juicy and sweet. Lots of natural vitamins. Simple shot. 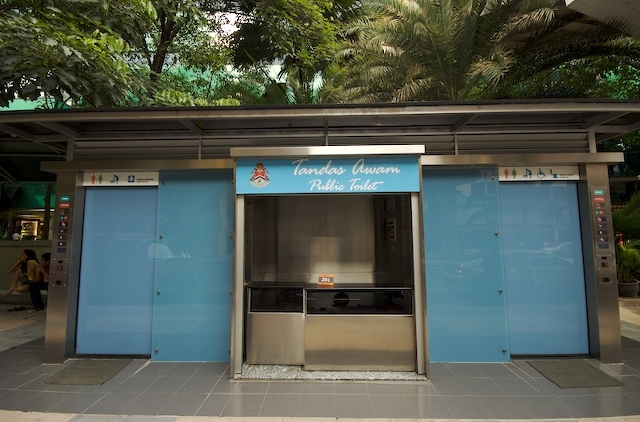 Yup, it's a public toilet. Wasn't difficult, was it? This one is right next to a bus stop and the other one is in front of McDonalds. 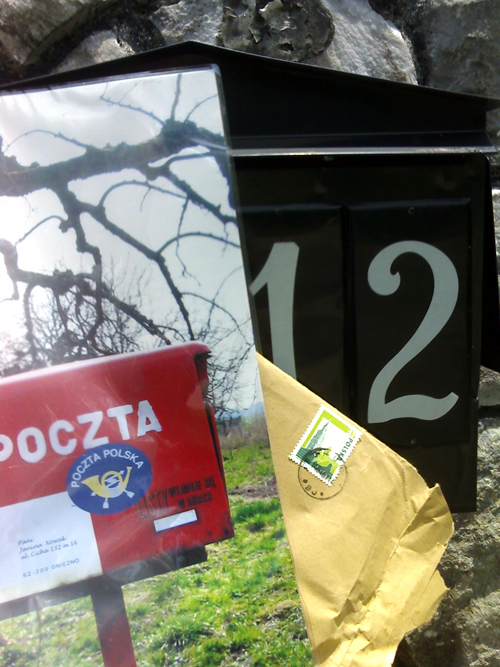 Those of you who guessed (local residents included) correctly will soon receive a KLDP postcard. Jazzy, you get one too just for your 'Time Machine' answer. So,please write me your mailing addresses as well as tell me which one of KLDP's pictures you like. I'm at edwinsumunatgmaildotcom. Hear from you soon. KLDP's first quiz. Guess what this is and you'll receive a postcard made from one of the many pictures in KLDP's archive. Best thing is you get to choose which one you'd like to see in your personal mailbox. Good? Great! Now, hints. There are 2 of these 'boxes' in less than a 1 mile radius and City Hall made a big deal of them. Even the Deputy Prime Minister came. You may notice the buttons. Pay a small fee and push a button for relief. Start guessing. I'll unveil the answer tomorrow. Have fun. From yesterday's mailbox to today's box of flying money. MIX FM has been travelling around the city with this contraption. 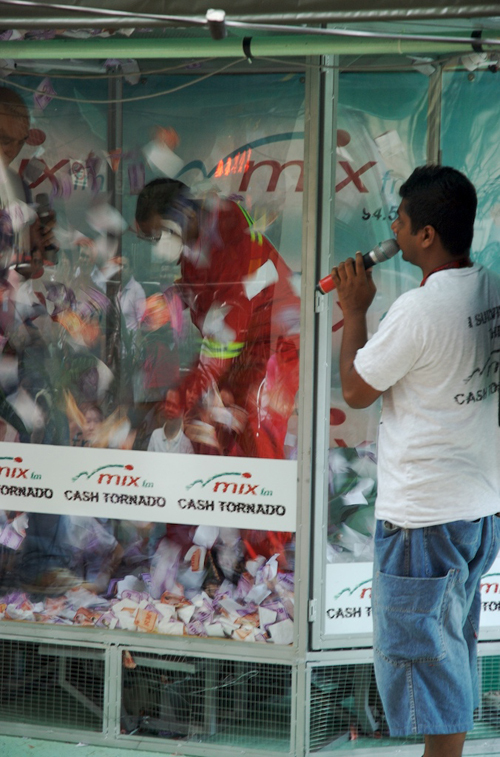 Wherever they stop, people come by and if someone is chosen to enter the box, they stand to win cash and prizes. The box is filled with coupons. Each person is given 30 seconds to grab as many airborne coupons as they can. This lucky guy in the box came out with RM1000 and a T-Shirt. I heard someone won RM13,000! Now, that's a day well spent. Come back tomorrow when KLDP launches it's first 'Guess What?' photo-quiz. I'll give you a head start: It's a box too! Click on any of these numbers to see how the other DP members around the world have interpreted the theme. Keep in mind the different timezones. Everyone 'posts' at their own time. ps. only showing you the KL Only half of the mailbox. 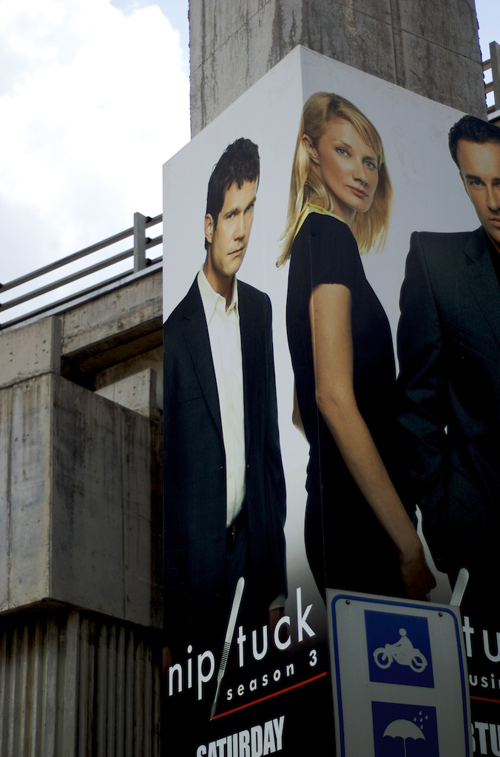 However, if you want to see what it looks like, click on KLDP's April 2006 archive. Hmm... both posts on 1st April.